This week we bring you part two of Paul Atherton’s mini-series that will teach professional self employed sales reps how to master their sales 'game’ and will help to significantly increase closing ratios. 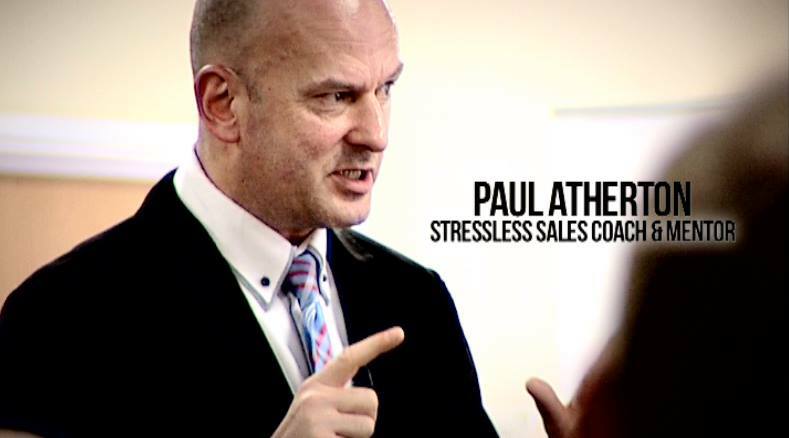 Paul has over 25 years experience working with self-employed sales professionals and has transformed the success of countless commission-only sales teams in a wide variety of industries. Are you able to get the buyer talking 80% of the time, with you speaking 20% of the time? Are you able to discover your buyer’s motives quickly? To totally satisfy their needs and wants without delay? Do you find closing effortless, “objection-less” and “resistance-less”? If the answer to any of these questions is not a firm YES, then help is at hand! The following five proven strategies for success and mastery of your 'Outer Game’ will ensure that you sell more than ever, achieve better conversion rates with your sales efforts and see your sales commissions grow by leaps and bounds! Remember: It takes 28 days to form a habit, so follow these steps each day for one month and you will begin to unleash a selling power you never knew you had! I keep 6 honest serving men. They taught me all I knew. Their names are What and Why and When and How and Where and Who. Open questions cannot be answered with a “yes” or a “no”. Instead, they prompt your counterpart to further conversation that will provide you with vital information to help get your sale. Write this information down as this is crucial for the next step, adding value. For now, probe further into the answers you are getting. This is where average salespeople stop – but not you! Ask how their current problems affect their business, what other consequences have resulted from their issues, how their unique challenges make them feel, who else is affected and how long have they been experiencing these problems. How much longer are they going to tolerate these issues and what cost can be assigned to this problem over time? You need to have an almost childlike curiosity. Keep asking why? why? why? until you have discovered their motives! Genuine curiosity is the key to success here and it will lead you to discover things you may never have imagined! This is where serendipity (a “happy accident” or “pleasant surprise”) makes an appearance. Specifically, serendipity is the accident of finding something good or useful while not specifically searching for it. Where other sales people get surface information, you will dig to discover diamonds! For now, ask open questions, listen to the answers you get and write down those responses, leave nothing to memory! Loop this process, punctuating it with matching body language that demonstrates listening (eye contact, nodding, an attentive posture for instance) but remember, don’t act, be authentic! Your customer should talk 80% of the time while you should only talk to ask questions about 20% of the time. As you read this are you recognising the power of this method? Its truth? Its magic? Believe it: it’s sales magic! You’ve already begun the process of building trust with your client, perhaps more than you may realise so now you need nail it down. Look at all the information you have written down and if you’ve done your job properly in step 1 there should be at least 1 page of a4 paper full of bullet points. Now all you need to do is organise them into priorities with your buyer’s help. Now it’s time to use “closed” questions to focus on the issues at hand. Re-state what your client has told you: the problem, when & how it came about, how it affects their operations, the cost to their customers, the further consequences and cost if it goes unresolved, and it’s resolution urgency and importance on a scale of one to ten. Repeat this process for every problem and desired outcome until you have a definitive list ranked in order one to ten for their urgency or importance. Then you need to summarise your list, in order of importance and urgency confirming with the buyer that you have things spot on. When you have finished your list, check with the customer if there is anything you have omitted, misunderstood, or measured incorrectly. The answer should be no if you have listened closely and asked the right questions. By this point the buyer should feel totally comfortable that you understand their issues and can actually work to resolve their issues; true empathy with the client has been established. You have now gone further than 80% of sales people on the planet but you aren’t done yet! Now you’ve earned the right to move on and “serve” the buyer. Starting with point number 1 on your list and make sure that you show (don’t tell!) how you WILL solve the problem. Talk in the future tense, avoiding the use of iffy words like “could”; use “will” instead. Certainty is everything here! Use true stories from other clients who had the same problem, received your help and happily no longer do. Prove your claims with testimonials, photographs, video, audio, comments and features on your website or social media pages, sales samples and product literature. Be prepared to make a live call to a client from the buyer’s office—in fact offer it—so that you can prove your words are more than just empty promises. Don’t sell features; sell benefits. Don’t sell what you do; sell what you can do for them that will help their business. People want to know what their future will hold after you begin to serve them. Show them what will happen after you start working for them! Turn all this into value! If they have a problem or need that your product or service can provide that is costing the buyer £500 a day now (or even £5), show how after having you in their corner the cost will turn into value! Repeat this for each problem on your list. Add all the value together. After each point in which you discuss how you can serve their need or wants ask the client if they have any doubt of what you have promised to deliver. The answer should be no. It is crucial at this stage not to talk in techno-babble, jargon or acronyms – unless it is absolutely certain that the buyer will understand your terminology, make no assumptions that they will though! After you have discussed with your buyer how you will serve their every need and want in order of urgency and importance, you should move on to step 4. If you want to get a commitment, first you need to make one! Don’t hesitate and don’t allow any momentum you have gained to slip away as you prepare to conclude your discussion. At this point the natural outcome of everything you have achieved so far, is to make a commitment so take a chance and initiate! The process is simple – begin by looking the client in the eye and reiterating that as of today you are in their corner. Review the steps you will take to resolve their and the timeline for these steps will be done by. You should tell them who else will be involved in reaching the shared goals you’ve outlined and arrange a time to make introductions if they so desire. Be sure that you convey absolute confidence and integrity as you go over your deliverables. Promise only what you can deliver – and be absolutely sure you can deliver when making your commitments! Finally, review the benefits your customer will receive by agreeing to work with you – how your services will generate value for the money they will be spending. Hold out your hand to your buyer and state that you are delighted to be welcoming them as a partner/client, that you are in their corner and look forward to helping them achieve their goals. You’re likely wondering where the “big close” is, all the objections and the tough questions – why does this seem almost too easy? Ultimately it’s because IF you have followed my advice from last month’s article regarding your inner game, and IF you have followed the steps 1 – 4 regarding your outer game then all the awkward closing/objection nonsense shouldn’t even be a blip on the radar! Judge this method on your own experiential results – not on what your mind may be telling you! This method will work for you and your buyer. It is the most forthright and honest way to serve your customers, to sell yourself and your services and ensure your customers walk away happy with the value you have provided to them. Finally follow up on what you have promised. Deliver every day. Make sure that everybody in your business understands the new client partner’s precise needs, wants and motives. Ensure that your client can be in touch at any time by providing them your mobile number, personal e-mail details etc. If delegating work to others be sure to keep your eye on progress and stay involved throughout the course of the project. Do not let anything or anyone stand in the way of meeting your deliverables. Speak to your client as often as they would like to make sure that they feel comfortable with your progress. You want to build an ongoing relationship – so once you’ve delivered and your client is enjoying all the benefits of your products/services they will consider you for future projects or recommend you to friends. Ask them for a personal testimonial to use when courting future potential clients. They will be delighted to oblige as you’ve gone above and beyond to make sure they’ve received stellar service. Ask them if you can call them personally if ever you are with a customer who needs reassurance – again if you’ve done your job right they should be happy to oblige. By living up to your side of the commitments you’ve made, you will generate loyalty and reap the benefits as you continue on in your professional life. You now have the top 'Inner’ & 'Outer’ Game strategies that are employed by prolific sales people I teach all over the world! So, what are you going to do with your new found knowledge? It takes just 28 days to form a habit so try it out and follow these methods for 4 weeks, one day at a time with no days off, before you judge their effectiveness. As many before you have discovered – you WILL unleash selling power that you never knew you had! I would love some feedback from those of you who are using these strategies – it would be my privilege to listen, coach and assist you in making them a successful, permanent part of your sales repertoire! With all respect and sincerity, I wish you every success as you go forward – you deserve it! Next Post So You Wanna Be a Sales Hacker?